The Cheesecake Factory is moving to Lenox Square. Calabasas Hills, California based-The Cheesecake Factory will leave their current two level restaurant at 3024 Peachtree Road and relocate to a single level, roughly 8,500 square foot space, at the front of Lenox Square. The popular chain restaurant was not offered a lease renewal of their current space and was thus in the market for a nearby replacement. The Lenox location will occupy a portion of what was for many years a Crate & Barrel store before they themselves relocated to nearby The Shops Around Lenox last year. I remember (as a passenger in my parents' minivan) driving down in 1993 when the current The Cheesecake Factory was being built adjacent to what later became ESPN Zone. (ESPN Zone shuttered most of their locations in 2009, including the Buckhead location which lasted ten years. Restoration Hardware plans to open a flagship location in its place next year.) 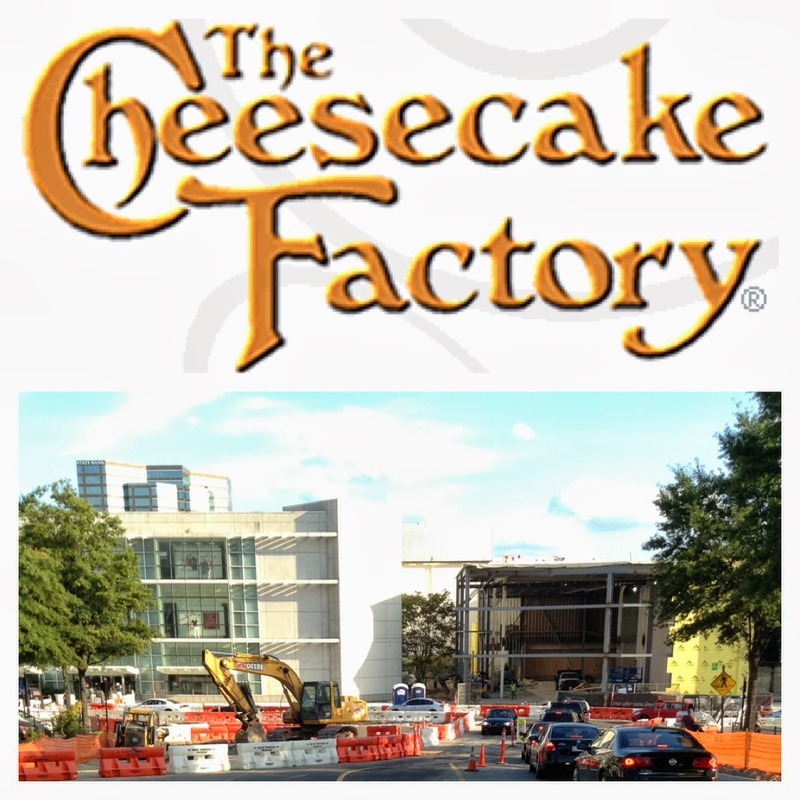 The Cheesecake Factory Buckhead was only the 8th location for the growing chain, and still holds a place in the hearts of many at corporate, among them, company founder David Overton. Today, The Cheesecake Factory boasts over a billion dollars in revenue at its 150 plus restaurant empire, which includes both The Cheesecake Factory and Grand Lux Cafe, in addition to their single unit Rock Sugar Pan Asian Kitchen. While neither The Cheesecake Factory or any official at Lenox Square has commented on the record, a permit was filed just yesterday for a commercial fire sprinkler with the City of Atlanta for "Lenox Mall Cheesecake Factory Overhead" which is likely the first step in getting construction moving. Back in March, I had announced that The Cheesecake Factory, along with a number of other restaurants, would open at Lenox Square. Basically, every other mentioned eatery (True Food Kitchen, Zinburger, Chipotle Mexican Grill, etc.) has now been acknowledged or in some way verified by Simon, except for The Cheesecake Factory. The Cheesecake Factory will occupy the corner space beside Macy's, and adjacent to what will soon be a new two-level Nike store. The new traffic circle is located right in front of where The Cheesecake Factory will open. The restaurant will also have a small outdoor dining area, as will other eateries joining them at the front of Lenox Square: Zinburger and True Food Kitchen. Zinburger and True Food Kitchen will essentially share the space that had most recently played host to Lenox Square Grill, and before that, The Clubhouse. The Cheesecake Factory is also opening a location at another Simon-owned mall, Mall of Georgia in Buford. The Mall of Georgia location will be the fifth Atlanta area restaurant for the chain, and is apparently on track to open in December. The Mall of Georgia location is opening in the outdoor portion of the mall, known as "The Village" replacing what was originally built as an F.A.O. Schwarz toy store. Timetables seem to frequently change but from I'm hearing lately, Zinburger is supposedly opening in January, followed by True Food Kitchen in February, and The Cheesecake Factory likely in early spring, or in other words, soon after the current location closes. Personally I'm far more excited about the openings of Zinburger and True Food Kitchen but I'm sure The Cheesecake Factory will do well once they open at Lenox Square. I agree about being more excited for the other 2 options. Dining at Lenox was never great considering it's the "crown jewel" of Atlanta malls. More options are long overdue. Interesting that all 5 Cheesecake Factory locations in Atlanta are in malls. Wonder if that's something the chain wants for most of their locations. Question for you: Any idea what's going in when Cheesecake leaves its current locations? Not to stir up anything, but... the reputation of Lenox as a "rapper and rapper wannabee" hangout is only going to be reinforced with the CF addition. I know lots of people who say the current clients of Lenox have made them choose to go elsewhere or nowhere. While traffic might be steady or even up, I doubt sales are. I agree with Anonymous, I live close to Lenox and avoid going there because I just do not feel safe and the crowds are just too much to handle. The only thing I like about The Cheesecake Factory is the cheesecake and varieties of it. The rest of their menu is bland. Don't get the hype of this place. Will be interesting to see how well the traffic circle works. I wish they could've split the entrance and exit on Peachtree. Move the entrance to the mall further down Peachtree and have the exit where it currently is. Peachtree and Lenox is a disaster because of the backup on the weekends. Their food is mediocre anyways. Variety of cheesecake is only good thing worth eating. Nice work as always Eli. I like to get grilled cheese at CF. Don't laugh. It's enormous to the point it's hard to finish and $7. I fill up on all the bread anyway. My last visit to Lenox was more of the rapper, sagging pants crowd during Labor Day weekend 2011 and I was not comfortable. I live in Nashville and on a recent visit to Atlanta avoided Lenox Square and instead went to Perimeter Mall. Gotta love all the code words used to avoid simply saying, "I'm uncomfortable around black people." I'll clue you guys in, "rapper type" is more transparent than you might think. Only a racist pansy would feel unsafe at Lenox. Rapper is code for black right? I wonder if black men call me a country singer. You know, since all white men sing country and molest children. Don't like being generalized? Those rapper dressing guys never buy anything anyway. Lenox unsafe? Please. The mall is saturated with security and the mall is always crowded with people. I stay away from the mall more because the shops do nothing for me. They're mostly just expensive clothing/jewelry shops that appeal to the 1%, otherwise known as a Republican's nirvana. Lol someone from little Nashville criticizing something in Atlanta. Take a look around, the skyline of Buckhead alone is bigger and nicer than Nashville's. I guess you country bumpkins aren't accustomed to big city life. Yes Atlanta is a diverse big city and if that scares you then stay away please. In regard to CF, just uninspired mediocre food that doesn't appeal to me. The vast majority of those herds of wannabee rappers are not buying stuff. They have no bags in hand and just hang at the Apple and MicroSoft stores playing games etc. It's not unsafe, but its also not very family friendly. Lenox demographics have changed. I think the new restaurants is a move to get the lost demo back. I agree with many that say that Lenox has a lot of "wannabee rappers", and no, I am not I doubt others are racist. Thinking that you are better than someone just because of your skin colour is ridiculous and ignorant. I don't like loud, obnoxious people, and I think "white trash" (I am white) is just as bad if not worse than these "wannabee rappers". I mean, didn't Gucci Mane almost get in a fight at Lenox not too long ago? Lenox is definitely almost peaceful through the week, but the weekend is awful. There are so many people not even buying or browsing and people could care less about running over children. Then Phipps has Legoland and too many children. Atlanta definitely deserves better. Similar sized cities have much better malls. I blame Simon. As for Cheesecake, I find it interesting that MOG is getting one at almost the same time. I wonder if Simon knew Cheesecake was desperate for a Buckhead location and made them lease space at Mall of Georgia in order to lease at Lenox. After all, MOG has had the space of a Cheesecake Factory for a while. "Lenox Square Mall is full of black people walking around, browsing and hanging out that don't buy anything compared to years ago when the mall had mostly white shoppers." ....there, that's what y'all really wanted to sayZ! Umm.... no. Saying that Lenox only has "wannabe rappers" instead of saying black people just doesn't makes sense because some of them are acutully like that: wearing baggy, huge atrocious Nike tee shirts and shoes, low pants. I don't care what colour you are I do not want to see your underwear. There are all different types of black people at Lenox. There are people who are more classy (like Oprah or Michelle Obama) and these wannabe rappers at the same mall on both ends of the spectrum. Trust me, I saw some white trash at Lenox too and I looked at them with just as much or more disgust than the wannabe rappers. If you don't notice a difference between those people (wannabe rappers) and normal black people then you must be blind. There are a ton of Black people buying at this mall. That's fine and great, I just don't want non classy people shopping at the upscale mall. Trust me, I dislike white rednecks more than actual or wannabe rappers. It's really funny that most of the time when a white person says something about wannabe rappers or sagging pants everyone yells "RACIST" and then when a black person talks about white trash no one says anything. I'm pretty sure each one is just as bad?? I came here to say something about how I couldn't possibly be less excited by 100% of the new tenants Lenox has recently announced... but I got distracted by the WHOA RACIST comments in this thread. Jesus, people. Funny how the intown neighborhoods support a ton of the best restaurants and don't have the crazy traffic that mighty Buckhead has and developers keep pumping an already saturated area with even more business that fail because of the competition. If just a few more big chains enter the midtown/ dar I say downtown market after all of the new projects finish in the next three years it would be the smarter fit as well as a more viable financial model. I guess it will be the same ole follow the "new" spot for the larger developments in the south. I'm inclined to not believe your previous statement. Many high end retailers wish they could break their current leases elsewhere for the opportunity to sell to the customers of that mall. It was the affluent spending of that Lenox Mall customer that Louis Vuitton recognized which lead to their placement of one of only 5 international stores right here in Atlanta at Lenox Mall only to have Bulgari and quite a few others to join them. The retailers you spoke about that moved from Lenox probably just couldn't afford the rent or stay open or found themselves not being able to meet the high end demand of Lenox Mall's more affluent client, rapper or not. Nice try. Passe intent, but nice try. Hmmm... U may have something there with the MOG thing. Right! Perimeter Mall where the carpet is stained with tobacco spittle. I could see why that would appeal to you being you're from Nashville. A reminder that it's Lenox SQUARE, not Lenox Mall. Lenox Square is indeed a mall, but "Mall" isn't part of its name.